Hero Slaw - Bring It! 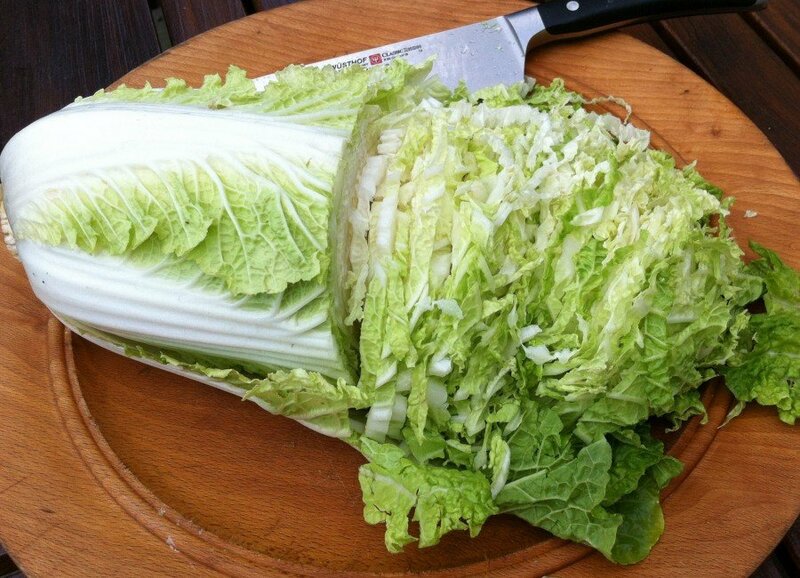 Behold the humble cabbage that became a neighborhood icon. It all started when I found this recipe in Sunset magazine. (When you are a west coast girl living in the east, Sunset is like crack, with all its pictures of patio parties, seaside picnics and year round outdoor showers.) I started making it one summer and people loved it. They asked for the recipe, cautiously, which was the first time I realized some people guard their recipes like state secrets. As if one person’s resolve is any match for google. Anyway, I made it more and people kept asking. I always sent the recipe along with its original name, but it became “Edie’s Slaw” by reputation. Then one time I paused before hitting send, and changed the title to “Edie’s Slaw.” I have never been great at self-promotion, but I figured with all the dicing and slicing I deserved some credit, right? Still, I never felt comfortable with putting my name on something just because I saw it first. It was our neighbor and plumber who solved both the distribution and naming issues. He had tasted the slaw at a mutual friend’s house and one time when he came to fix our frozen pipes he mentioned how much he liked the slaw. I passed along the recipe. A few years passed, and as far as I could tell I remained sole bearer of the slaw. Finally, one summer I ran into the plumber on a non-professional basis, and he said he needed to make a confession. That’s when I decided to name it “Hero Slaw” and leave it at that. 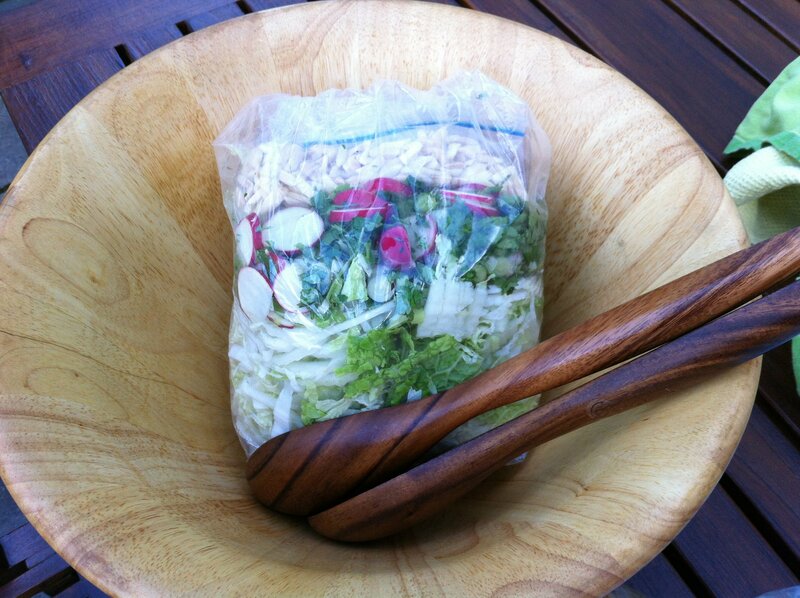 Not two days later a woman I barely knew waved me down as I made my way home: “I made your slaw again yesterday. It’s great!” So here it is, your key to getting an invite to every pot luck you desire. Place almonds in a 9-inch cake pan. Bake in a 350° oven until golden, shaking pan once, 6 to 9 minutes. 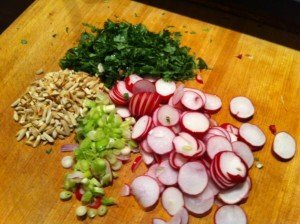 In a large bowl, combine cabbage, snow peas, radishes, green onions, and cilantro. Add dressing and almonds to cabbage mixture; mix gently to coat. Pour into a serving bowl. I often leave out snowpeas and radishes because they actually require effort. Of course, the one time I did make the extra effort and put them back in someone said, ”The radishes really make it don’t they?” and it sort of ruined that short cut. I also cut the mayo—half or even more than half–with light sour cream or entirely with light mayo, and have substituted slivered almonds with whatever crunchy thing I have on hand. One friend said it even is great with Nayonaise, the Vegan alternative. Another forgot the mayo entirely and said it was good. But she may have already been in to the freezer daquiris. 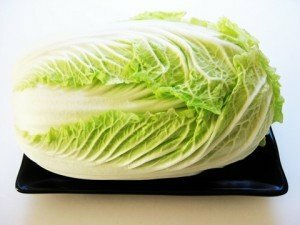 As for the cabbage, I have tried it with regular cabbage and savoy. It’s just not the same. Sorry. Cut the cabbage and put it back into the bag it came in. Then layer on other ingredients. Put toasted almonds in a snack sized baggie on top and tie it all with a rubber band. Put the dressing in a mayo container and pile it all in the bowl you’ll serve it in, then in the cooler. Dump, add nuts, dress and you’re good to go. All bagged up and ready to travel. This entry was posted in Salads and Sides on July 3, 2013 by Edie Morgan. Pingback: People's Choice Cornbread | Bring It! Pingback: Game Day Pulled Pork | Bring It!